It is fair to say that many commercial buildings suffer from moisture ingress, either through internal water leaks or driving weather, that puts pressure on building subtrates. In November 2013, Thermoscan® Inspection Services were asked to assist Bells High Access Services in identifying possible water leaks through the external southern façade of their Clients property in Brisbane. Bells have been identifying water leaks in buildings for many years, using traditional and proven methods of both visual identification and flooding techniques to either find the source or remedy the repair. In this case, the leaks were a number of storeys in the air and abseiling was the best method of getting to the area of concern. Our technician gave the abseilers a training session on the use of the thermal camera and sent them over the edge to locate the possible source of the leaks. As seen in the images below, the themal camera was able to detect temperature differentials, highlighting the possible areas of moisture penetration. Stephen Thornton, Manager of Bells, was extremely impressed with the additional information we were able to produce in our detailed Building Report which confirmed their previous assumptions as well as identifying a number of other areas of concern. Bells were able to provide this information to compliment their assumptions to the Building owner. Stephen is now convinced that Thermography will play a key role in future water ingress requests from his customers. 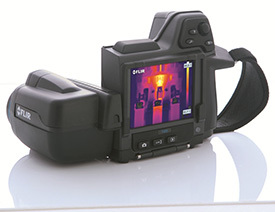 Thermal Imaging is an outstanding tool to locate building defects such as missing insulation, delaminating render, air leaks, condensation, mould, moisture ingress problems and construction failures.